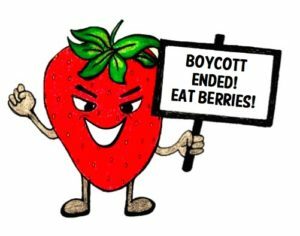 Boycott of Sakuma Bros. Berry Farm berries Ends! As of today we have officially agreed to an election and negotiation process for a collective bargaining agreement with Sakuma Bros Berry Farm. Thanks to your tireless efforts we are entering into this next phase of our union’s development with hope and determination. At this time we are calling for an end of the boycott, and all boycott activities. Out of respect for the process and our memorandum of understanding with the company please do not contact past, present or potential customers, purchasers, sellers or users of products coming from Sakuma Bros Berry Farm to convey criticism of any and all aspects of Sakuma’s business and operations. Please stay tuned at the Familias Unidas por La Justica Facebook page for updates. 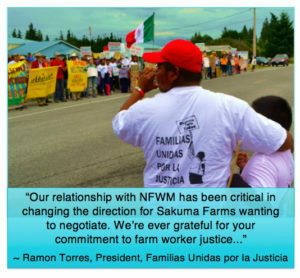 National Farm Worker Ministry (NFWM) is pleased to announce that Familias Unidas por la Justicia (FUJ) ended their boycott of Sakuma Berries, Driscoll’s Berries and Häagen-Dazs strawberry ice cream on Sept 4th. Familias Unidas por la Justicia and Sakuma Bros. Farm have officially agreed to an election and negotiation process for a collective bargaining agreement. For FUJ, this has been a long 3+ year struggle for farm workers’ self-determination on issues of wages, housing and working conditions. NFWM’s board of directors endorsed the boycott at their board meeting in July 2015. Since then, member and supporting organizations, and many individual supporters have participated in postcard writing, social media campaigns, public demonstrations, meetings with the Sakuma CEO and phone calls to the boycott targets. NFWM is pleased that these efforts raised awareness and built support for the farm workers’ struggle. Yet it is due to the courage of the farm workers themselves risking job security, intimidation and harassment that they reached this stage. In the coming months, NFWM will continue to accompany FUJ and monitor the process going forward. We are hopeful that a fair and reasonable contract will be reached quickly. National Farm Worker Ministry stays true to our roots as a faith-based organization committed to justice for and empowerment of farm workers. Our work is to stand in solidarity with, NOT speak for, farm workers so that we can amplify their voices and increase their efforts. We thank all of our supporters whose actions helped FUJ achieve this great step in their struggle for justice.